NYC, 02/02/2019, 2:00PM. 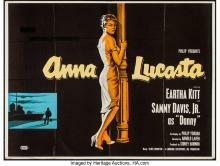 Anna Lucasta (1958): Drama based on a play. 97 min. Director: Arnold Laven. Starring Eartha Kitt, Sammy Davis Jr., Frederick O'Neal. This movie is a remake of the 1949 version Anna Lucasta (directed by Irving Rapper and starring Paulette Goddard), which itself was an adaptation of Philip Yordan's 1936 stage play. It was shot at Samuel Goldwyn Studio from early May through early June 1958.